Afterwards, we stayed for the school picnic. I brought this salad, but don’t be fooled into thinking that the kids even tried it–they had sandwiches instead. 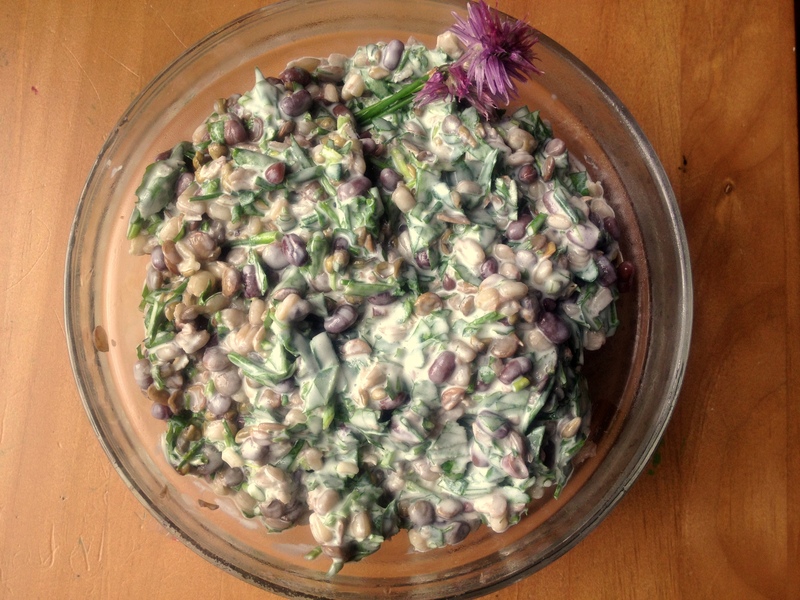 Lentil-Yogurt Salad: Wash and chop a big bouquet of greens and herbs. I used a big handful each of arugula and chives, a hefty sprig of mint, and small handful of cilantro; finely chopped, these made about 1 ½ c. of greens. Scoop about 1 c. greek yogurt into a bowl and season it with a splash of olive oil, a few generous pinches of salt, and the juice of a lemon. Stir in the chopped herbs and about 3 c. cooked lentils or mung beans (I used a combination). Taste and adjust seasonings. Sprinkle with chive blossoms if you have them in your garden and serve alone or with lettuce cups for scooping. One of my favorite photos is my oldest daughter at her Kindergarten graduation … Frilly dress, mortarboard and pride, celebrating her accomplishment. Thanks for bring back that memory! And, what a good occasion to eat lentils. Your salad sounds yummy! My oldest just finished kindergarten as well–instant nostalgia! I know it’s been said before, but I really can’t believe how quickly they grow up. Good thing it just keeps getting better and better! Thank you so much for the nomination! I am especially honored because I love The Plum Palate website so much, both your writing and your food. I feel like we are cooking kindred spirits! Love the kid stories! I once had a group of 3rd grade boys in my yard, all playing football on a nice, warm spring day. One boy (not my son) came to the door and asked if they could wash the muddy football in the bathtub! I absolutely said, “No,” and then had to call my husband to laugh about it. Interesting the way their minds work, sometimes. I have been putting yogurt-herb sauces on everything–tastes like summertime! Those are great kid moments and the salad isn’t too shabby either! It does go by alarmingly fast, this whole raising of kids. I was eating a salad with my daughter yesterday and watching Mission Impossible: Ghost protocol when we both said out loud, “that Jeremy Renner is cute.”…. and I thought to myself, I couldn’t even imagine this day when she was a toddler and here we are. (Eating salad and commenting on the cuteness of an actor). Every stage has been a blast and food has been a running theme throughout our relationship. Guess what? Stuff they won’t eat now, they will actually sit down and enjoy with you later! :) BTW, did you treat the arugula more as an herb instead of a green? Oh, how sweet. As these baby moments pass, I console myself by thinking about how much I will love these kids for the rest of my life. :) Yes, I’d say I used the arugula more as an herb here, although it’s a fine line and I like to blur it: arugula pesto! Broccoli pesto! Parsley as a vegetable in tabbouleh! Etc. This looks like a terrific salad for the summer. Yogurt and lentils? Yum! Did you see the chive flower vinegar on http://www.foodinjars.com? That looks like a great way to preserve that amazing color all year long! It’s pretty much exactly that! Chive blossoms in coconut vinegar. I did two weeks in the fridge instead of three on the countertop so the color isn’t as pretty. It taste delicious thought! And what a great blog! Thanks for introducing me to it! Lentil yogurt might honestly be a bit farther than I’m willing to go, but I love the story of the highly missing stuffed animal, rescued in a pant leg. This looks delicious! We LOVE lentils and yogurt already – adding the greens just seems like a natural, fresher progression. Can wait to try it.